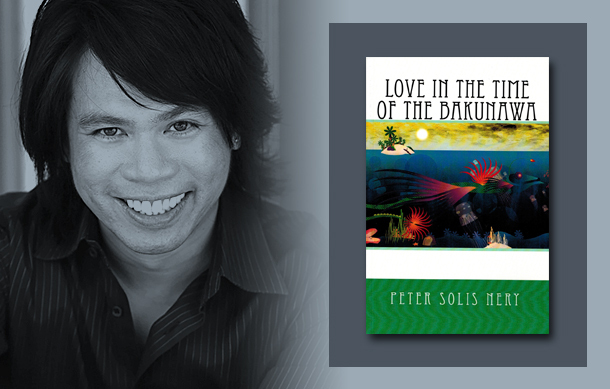 Love in the Time of the Bakunawa is Peter Solis Nery’s first novella in English, and also his first full-length feature film as writer, producer, and director. It is the story of a loveless and struggling artist who comes home to an island only to realize that the island’s summer festival attraction that his grandmother created may yet provide the perfect background for finding his own success in love and career. A naked hunk. A virgin. Midsummer’s night. On a moonlit beach. Now, rehearse the story. On the third night, the story goes, with a full moon hanging low on the horizon, the second full moon of the month—a blue moon, to everyone’s shock, the bakunawa suddenly grew legs, transmogrified into a dazzlingly handsome man, his dark tanned features set off perfectly in a suit of purest white. Now, on the festival beach, a dark-skinned man—young, athletic, hunky, extremely good-looking in a white long-sleeved shirt (unbuttoned), white sleeveless undershirt (clingy), white pants (now hugging his powerful legs) rose out of the water, shook off the water from his hair as if in slow motion. Like in a David Hasselhoff cologne commercial. Run as fast as you can! he said to a girl who Matt judged to be barely eighteen. I’m coming right behind you! warned the man in white as he started running on the water’s edge, splashing playfully as he went, chasing the girl in a white bra, white sarong wrap. They rolled on the sand. Made frantic love on the sand under the moonlight. Matt watched the couple in the sand. Then, turned away with Catholic guilt. Again the story: rising out of the water, the bakunawa strode over the beach crushing the powerless shrimp under his large bare feet. Behind his back, native men mocked him, snickered at his white costume, but none dared face him, for he had a terrifying mien and laughed wickedly at the crunching sound of shrimp shells underfoot. Women, however, were beguiled by his raw manliness, threw themselves shamelessly at him, followed him like faithful pets.